Duke Paoa Kahanamoku Lagoon is a small, man-made wading pool in the Waikiki neighborhood of Honolulu, on the south shore of the island of Oʻahu near the Ala Wai Small Boat Harbor and Fort DeRussy Military Reservation. The Hilton Hawaiian Village is adjacent to the lagoon. The lagoon was developed in the 1950s along with Henry J. Kaiser's Hawaiian Village development project. Once completed, the new beach and lagoon were named after surfer and Olympic swimming champion Duke Kahanamoku. In 1961, Hilton Hotels acquired Kaiser's Hawaiian Village Resort property. As the lagoon aged, it became murky, stagnant and undesirable for swimming. In 2006 the lagoon underwent renovations for approximately $15 million. With introduction of a new water circulation system, smaller size and shallower waters, the pond became a desirable swimming spot for many. The renovations also incorporated a small island, palm trees, and a boardwalk. 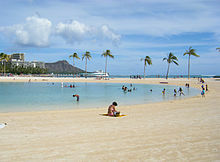 On October 16, 2007 the lagoon was officially re-opened with a ceremony attended by Hawaii Lieutenant Governor Duke Aiona and relatives of Duke Kahanamoku. ^ "Hilton Lagoon Revived". honoluluadvertiser.com. Honolulu Advertiser. Retrieved 16 September 2018. This Hawaiʻi state location article is a stub. You can help Wikipedia by expanding it. This article related to Honolulu is a stub. You can help Wikipedia by expanding it. This page was last edited on 8 April 2019, at 17:18 (UTC).